The SAT is a standardized test widely used for college admissions in the United States. It was first introduced in 1926, and its name and scoring have changed several times, being originally called the Scholastic Aptitude Test, then the Scholastic Assessment Test, then the SAT I: Reasoning Test, then the SAT Reasoning Test, and now simply the SAT. 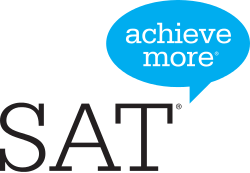 The current SAT, introduced in 2016, takes 3 hours to finish plus 50 minutes for the SAT with essay, and as of 2014 costs US$52.50 (up to US$101.5 outside of the United States), excluding late fees. Possible scores on the SAT range from 400 to 1600, combining test results from two 800-point sections: Mathematics and Critical reading and Writing. Taking the SAT or its competitor, the ACT, is required for freshman entry to many, but not all, universities in the United States. On March 5, 2014, the College Board announced that a redesigned version of the SAT would be administered for the first time in 2016. The exam reverted to the 1600-point scale, the essay was made optional, and students now have 3 hours to take the exam plus 50 additional minutes to complete the essay.